For years statistics have shown that most police shootings occur at close distances under 21 feet. The R.E.A.L. Defensive Shooting System was developed as a basic practical tool for the private citizen and law enforcement. It provides research supported practical shooting principles, techniques and concepts specifically designed for close range life threatening situations. For the last decade of F.B.I. police officer shooting statistics have consistently shown 50% of all police shootings occur within 5 feet and 80% of all police shootings occur within 20 feet. From this distance, point shooting can give a shooter well placed body shots/hits on an assailant(s), when it is combined with proper stance, grip, and trigger squeeze. My personal practice has shown that the most effective stance for use with the point aim technique utilizes leaning your upper body slightly forward with your body squared on the target and your feet shoulder width apart. Leaning your upper body slightly forward as well as locking out your elbows will counter act weapon recoil, and this stance creates a stable base and allows easy movement forwards, backwards as well as pivoting right or left. The grip utilizes a firm two hand hold to reduce muzzle rise and ensure weapon alignment on the target, and both arms fully extended to point the weapon straight at the target and counter act weapon recoil. The weapon is centered on the shooter’s body and pushed straight forward at the target while bringing the weapon up to eye level and even with the shooter’s line of sight on the target. This ensures body/weapon alignment on the target which in turn enables the shooter to fire very quick first shots at the threat, and a straight back trigger squeeze ensures accuracy. The top competitive IPSC shooters such as John Shaw and Rob Latham use a front sight focus technique. After they draw their weapon, they focus on finding the front sight as quickly as possible. As soon as they see the front sight on the target, they squeeze the trigger twice as quickly as possible. This allows them to get quick accurate multiple shots/hits on the target. The biggest delay in this technique comes from the time it takes to focus on the front sight and find it on the target (i.e. sight picture), before they squeeze the trigger. The point shooting technique is a primary lesson taught by the Israeli Defense Force. It eliminates the delay in focusing on the front sight and finding it on the target. Instead the shooter points the weapon at the target utilizing the proper stance, grip, and trigger squeeze to get very quick accurate shots/hits on the target. In my experience, the maximum effective range for point shooting is 20 feet (while focusing on center mass body shots), and this happens to be the where 80% of all police shootings occur. Combining the point aim technique with the front sight focus technique will allow a shooter to get faster accurate center mass body shots/hits on the assailant(s), followed up by accurate headshots for stopping power. 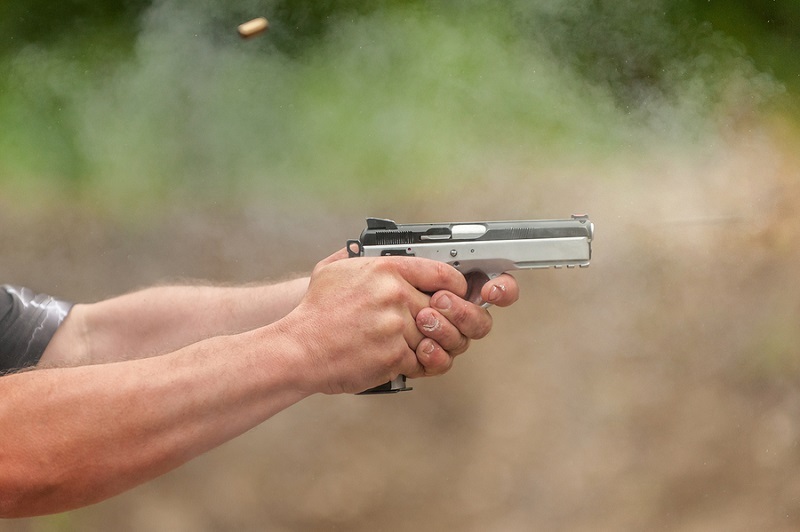 While the shooter is using the afore described point aim process to obtain well placed body shots/hits on the assailant, the shooter can begin to focus on the front sight of his weapon. By the time, the shooter has fired one or two shots on the body, he/she will have clearly focused in on the front sight, and he/she can move the front sight upward on the head (i.e. sight picture) for an accurate head shot to deliver the desired 100% stopping power effect. Point shooting can also deliver very accurate first shots to the head at close range (0 – 10 feet). Shooting accuracy and bullet placement are the most important aspects of quickly ending a life-threatening armed assault. Documented research has proven that the most important thing in a gun fight is quickly getting multiple well placed center mass body hits and head shots on your assailant(s). In 1993, “Police Marksman Magazine” completed a five year long, voluntary survey researching police shootings. The goal was to use the data to determine if any specific type of ammunition (used by police departments at that point in time) was better able to stop an assailant with a single shot. They referred to this as stopping power and thus the name: “…Stopping Power Survey”. They were able to compile data from 241 actual, verifiable shooting events throughout the U.S. Their research focused on four handgun calibers: .38 Special, 9mm, .357 Magnum, and .45 ACP. Their overall “Success Rate Comparison…(for)…All records to those with a single Torso hit” revealed the .357 Magnum had a 71.4% success rate, the .45 ACP had a 66.6% success rate, the 9 mm had a 55.5% success rate, and the .38 Special had a 39.0% success rate. This research proves that no caliber handgun can guarantee to stop any assailant every time and in every situation with only one torso hit. Furthermore, there have been numerous reports of assailants surviving multiple shots to the body with small and large caliber handguns, so just hitting the assailant doesn’t guarantee stopping the assailant. However, the previously noted “Police Marksman Magazine”, survey on real life shootings, documented the fact that all head shots stopped the assailant(s) 100% of the time. FBI research has also documented that only shots severally damaging the brain or severing the central nervous system could be depended on to stop the assailant. Wyatt Earp is reported to have said that in a gun fight, you have to take your time fast. He was trying to emphasize that you must quickly find your sights and fire an accurate shot at your attacker. Wyatt Earp survived several close range gun fights, so I take his advice to heart. Shooting on the move makes you “mobile and lethal”. It enables you to maintain your reactionary gap, reduce the attacker’s accuracy, and it can be used defensively as well as offensively. The reactionary gap is the distance between an assailant(s) and the shooter. This gap must be large enough to give a shooter time to see the assailant’s action(s), understand them, and take the needed reactive defensive measures, before the assailant can physically come in contact with them. Once a assailant has closed the gap and is physically assaulting the shooter, drawing a weapon may become nearly impossible, and the assailant may be physically stronger, so getting disarmed by the assailant becomes a real possibly. Common sense will tell you that it always takes more time to react to another person’s actions. Therefore, defensive shooting should always mandate a large enough reactionary gap to allow the shooter to react, before the assailant can make a physical assault. However, this distance does not have to remain static. If the defensive shooter can move laterally or back away from the assailant(s) in a controlled manner, while drawing their weapon and engaging the assailant(s) with well placed multiple center mass body hits and focused headshots, then the reactionary gap becomes constant and much more adaptable to varied, ever changing real life situations. Reducing an attacker’s accuracy can be achieved through mobility. Common sense also tells us that a moving target is harder to hit than a static target; you become a moving target, when you move laterally or back away from the assailant(s) in a controlled manner. Is a life and death shooting situation extremely stressful? Yes! Can we exactly reproduce that stress on a practice shooting range? No! However, we must do what we can to increase the level of stress in practical shooting courses as well as teaching some techniques to overcome that stress. This will give the officers an understanding of how stress will affect their shooting and how to overcome those effects. This combination will give them the tools to win in a life and death shooting situation. shooter forgets all the low stress shooting fundamentals, and he/she responds exactly as they were trained. This fact has been proven time and again by militaries around the world. This fact alone justifies research backed practical firearms training. Stress can be inserted into firearms training in several ways. The Israeli Defense Forces use physical contact. The trainer stands to one side of the shooter, and he/she pushes on the shooter’s shoulders just before shooting. I have seen good success using competition against the clock, against another shooter, against a mandated “No Miss” scoring policy, or all three. I recommend using all three. This most recent study is another example of the effectiveness of the point shooting technique in real life situations, and the failure of current law enforcement as well as civilian law enforcement based firearms training techniques to readily prepare shooters for real life personal defensive firearms situations.